It would help if the villain wasn’t using a squirt gun. But they must be doing something to Iron Skull. His face is a little bit more bent out of shape every time I see that guy. You’d think–just by accident–someone would hit him somewhere else. Even well-trained cops and soldiers can’t always nail a head-shot every time they try. On the other hand, a squirt gun might be JUST the ticket for an iron skull. Rust FTW! His pose looks very awkward. 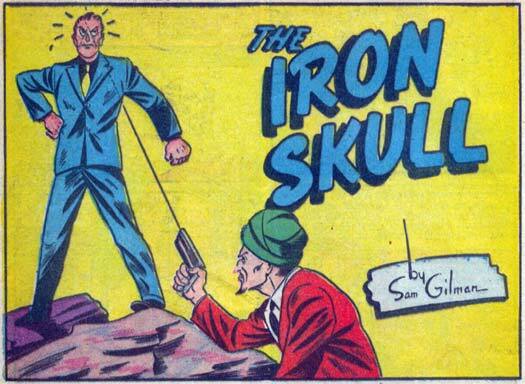 The Iron Skull appears mighty annoyed by someone shooting him square in the forehead. D’you think people try throwing pebbles at his skull just to hear the sound and/or annoy him? Speaking of sound, where’s the onomontopowia? I’ve noticed that the Golden Age comics don’t use onomontoPOWia nearly as much as they do now, and often it’s completely missing altogether. Even when they do put it in, it’s often just simple black letters.